228 Marlborough is located on the south side of Marlborough, between Exeter and Fairfield, with 226 Marlborough to the east and 230 Marlborough to the west. 228 Marlborough was designed by architect William Whitney Lewis and built in 1879-1880 by Woodbury & Leighton, builders, as the home of Dr. William Fiske Whitney, Jr. He is shown as the owner on the original building permit application, dated November 25, 1879, and on an amended application dated February 19, 1880. 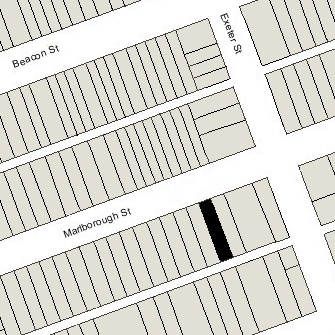 The house appears as 224 Marlborough in the 1880 City Directory but was renumbered as 228 Marlborough by 1881. The house was completed and had become William Whitney’s home by the 1880-1881 winter season. He previously had lived at 90 Charles. He purchased the land from the Commonwealth of Massachusetts on July 10, 1882, after the house had been completed. The land previously had been sold by the Commonwealth at public auction and Dr. Blake either was the successful bidder or acquired the right to purchase the land from the successful bidder. He owned the right to purchase the land by December 8, 1879, when he entered into a party wall agreement with Clarence P. Blake, owner of the right to purchase the land at 226 Marlborough. Click here for an index to the deeds for 228 Marlborough. William Whitney was trained as a physician and pathologist, and from 1879 was curator of the Warren Anatomical Museum of Harvard Medical School. He married in April of 1888 to Louise Elliott. She was a concert singer. After their marriage, they lived at 228 Marlborough. He died in March of 1921. Louise Whitney continued to live at 228 Marlborough. Their two children, Lyman Fiske Whitney and William Elliott Whitney, lived with her. They both were engineers with Comstock & Westcott, Inc.
William Elliott Whitney married in June of 1923 to Rosalie Jones. After their marriage, they lived in Watertown. 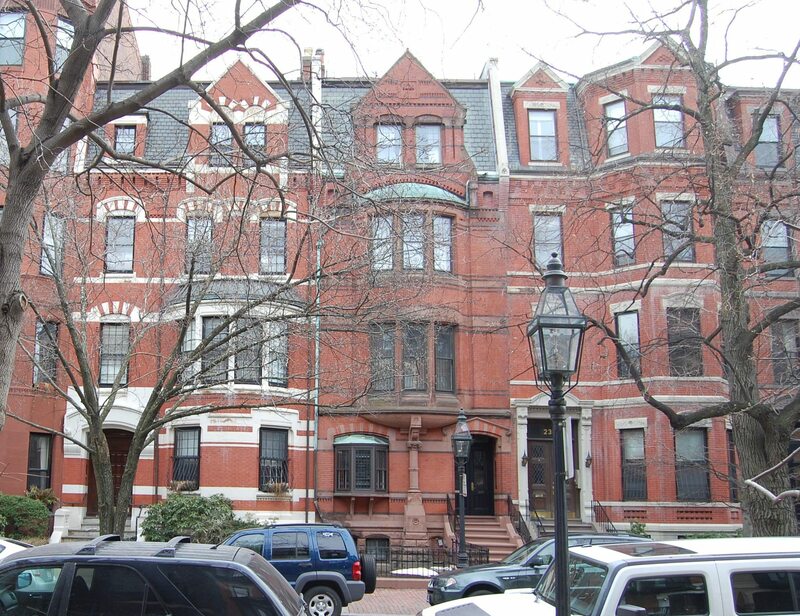 Louise Whitney and Lyman Fiske Whitney continued to live at 228 Marlborough. They also maintained a home in Marblehead. By the 1925-1926 winter season, they had been joined by Louise Whitney’s niece, Louise Elliott Littlehale, the daughter of James M. Littlehale and Gertrude (Elliott) Littlehale. Lyman Fiske Whitney married in 1931 to Mrs. Eunice Elizabeth (called Elizabeth) (Dalton) Rounseville. After their marriage, they lived in Newtonville. Louise Littlehale married in December of 1939 to Donald Bruce Mansfield. He was a lawyer and would later become a senior executive of the Ohio Edison Company in Akron. After their marriage, they moved to Washington DC. Louise Whitney died in March of 1942. 228 Marlborough was inherited by Lyman and William Whitney. 228 Marlborough was shown as vacant in the 1943 and 1944 City Directories. From 1945 it was the home of Mary F. Duffy, who was housekeeper for the Whitneys. By 1947, 228 Marlborough had become the home of Lyman and Elizabeth Whitney. They previously had lived in Cambridge. He continued to be a research engineer and she was executive secretary of the Boston Committee on Alcoholism. 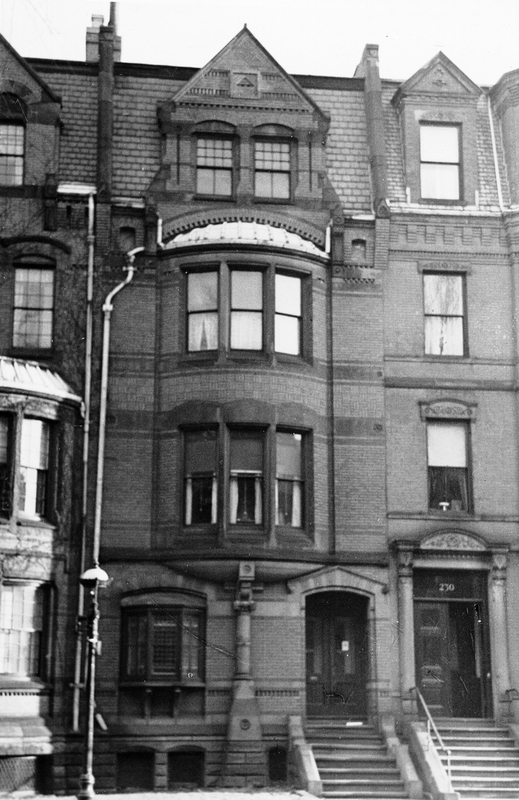 Mary Duffy continued to live at 228 Marlborough, as the Whitneys’ housekeeper, until her death in August of 1948. Lyman Whitney died in May of 1957. Elizabeth Whitney continued to live at 228 Marlborough until about 1959, when she moved to South Duxbury. On August 25, 1959, 228 Marlborough was purchased from Elizabeth Whitney and her brother-in-law, William Elliott Whitney, by Jordi Folch-Pi and his wife, Willa (Babcock) Folch-Pi. They previously had lived in an apartment at 7 Exeter. Jordi Folch-Pi was director of research at McLean Hospital and, from 1956, was Professor of Neurochemistry at Harvard Academy of Arts and Sciences. He is considered one of the founders of chemistry of complex lipids and a pioneer in the development of neurochemistry. Willa (Babcock) Folch-Pi was Academic Dean of Tufts University in Medford. Jordi Folch-Pi died in October of 1979. On September 9, 1980, 228 Marlborough was purchased from Willa Folch-Pi by Theodore Monacelli, an architect, and his wife, Dana T. Monacelli. In August of 1980, prior to conveying the property, Willa B. Folch-Pi applied for (and subsequently received) permission to convert it from a single-family into three units. With the application, she provided an affidavit indicating that she had entered into a purchase and sale agreement with the Monacellis and that it was their intention to “use the premises as a multi-residence dwelling and will occupy one unit themselves.” Theodore Monacelli was shown as the architect for the remodeling. 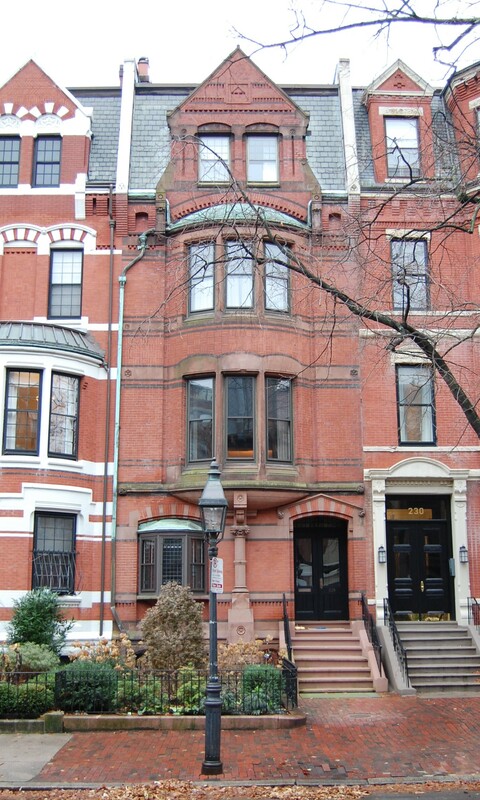 On July 31, 1985, the Monacellis converted the property into three condominium units, the 228 Marlborough Street Condominium. On March 25, 2009, Kenneth Morris Attie and his wife, Heliana Tavares Attie, purchased Unit 1 of 228 Marlborough, on April 2, 2009, they purchased Unit 2, and on January 4, 2010, they purchased Unit 3. On September 28, 2012, they removed the condominium status for the building, returning it to a single-family dwelling. 228 Marlborough remained a single-family dwelling in 2016.